Teachers in Oaxaca and other Mexican states are increasingly fearful and resentful of both their union and the ruling Partido Revolucionario Institucional (PRI). Since the 1970s, Mexico’s Coordinadora Nacional de Trabajadores de Educación (CNTE) has operated as a formalized dissident caucus within the Sindicato Nacional de Trabajadores de Educación (SNTE), the national union that has been an essential part of state machinery since the 1940s and strongly aligned with the PRI. CNTE rallied for many causes, such as union democratization, regional autonomy, and economic justice, and enjoyed the most popular support in the 1980s. As they accumulated power in the 1990s in states like Oaxaca, CNTE leaders turned to neo-corporatist strategies to incentivize teachers’ participation in union mobilizations. An extensive point system, for example, rewarded teachers for going to marches, camping out during strike periods, and attending rallies in Mexico City; teachers who failed to participate in a minimum amount of activities lost union privileges and benefits. By 2005, Oaxaca’s union had split over its focus on politics rather than pedagogy. Over the last ten years, dissident teachers have increasingly faced government pressure and violence. In 2006, military police broke up a rebellion led by striking teachers in Oaxaca state, in which dozens of activists were killed. In 2013, the massive teacher strike against President Peña Nieto’s constitutional reforms – which would require states to implement national education policies – ended with the violent eviction of teachers from Mexico City’s zócalo. In 2014, 43 student teachers in Guerrero state were massacred, and last year over a dozen protesters were killed in Nochixtlán, outside of Oaxaca’s capital city. Although these incidents provide teachers’ unions considerable cause for continued mobilization, my research indicates that teachers in states like Oaxaca are less convinced that their ongoing struggles represent authentic political resistance. Many say they are fulfilling syndical obligations – less a reflection of personal convictions – because attendance is recorded and assures payment. Teachers tell me that they trust neither the government nor the union; they see government as an entrenched century-old political machine that has resurged with more impunity than ever, and the union – both nationally and regionally –as driven by special interests and cronyism. Maestros feel they have little recourse but to fend for themselves and families. They fear the violence that the government may visit upon them, but they also fear the public shaming they face if they criticize the union’s political tactics or support government reforms. Education reform in Mexico is vital to improve the overall quality of teaching and learning – and to address the social and economic inequalities across the country. Government action is essential to such efforts, but endemic corruption has stained the public’s image of national and state leaders, cultivating distrust of top-down policies. The union is also essential to protecting teachers’ interests and challenging the hegemony of the national government, but its neo-corporatist strategies such as the point system delegitimize the activist banner waved by leaders in states like Oaxaca. Especially with increasing symbolic and physical violence, teachers are in an impossible position, stuck between two forces they don’t trust and facing dire consequences if they challenge the authority of either the government or union. Though dissident teachers are important to putting a check on government impunity and corruption, the union’s sustained mobilizations have negatively impacted their profession and student achievement. While “the teacher fighting is also teaching” – a common refrain in Mexico – teachers must also be free to step away from the march and into the classroom. * Christian Bracho teaches in the International Training and Education Program at American University’s School of Education. The Mexican government’s latest reaction to the country’s largest teachers union’s challenge to education reform is triggering accusations of gross human rights violations at a time that President Enrique Peña Nieto is already under severe pressure over the case of the missing 43 students from Ayotzinapa, even if the union’s reputation – and the government’s historical demonization of it – may undercut the teachers’ cause. Protesters associated with the Coordinadora Nacional de Trabajadores de la Educación (CNTE) clashed with state and federal police in Nochixtlán, Oaxaca, on June 19, leaving eight dead, more than 100 wounded, and at least 25 detained. The clashes culminated a series of CNTE-led protests over a 2013 reform that puts the onus on teachers for student success through government-mandated tests and teacher evaluations – akin to the U.S. “No Child Left Behind Act.” CNTE members consider the reform disconnected from the realities of teaching in Mexico’s underprivileged, indigenous, and rural environments, and view it as a threat to their collective decision-making authority and hard-won benefits from the 1980s and 1990s. The CNTE denounced Nochixtlán as another example of excessive police force, and press reports and citizen testimony have refuted the President’s claim that police met protesters unarmed. The administration subsequently offered to meet with union leaders to discuss the reform, but it was seen as offering too little too late. The CNTE is not the country’s most respected institution, but its complaints about the brutal police reactions to its protests have merit and have stimulated a national debate on Mexico’s commitment to human rights. The union’s reputation has been tarnished by repeated disruption of school schedules, internecine strife, recent arrests of leaders on corruption charges, and a recently eliminated, but oft-cited, benefit that allowed union members’ children to inherit their jobs regardless of merit. But the state’s implicit culpability in the disappearance of the 43 students in Ayotzinapa and the death toll on June 19 seems to have tipped the perceptions of its dispute with the state momentarily in favor of CNTE. That dispute and others with popular organizations have deep roots – going back to mobilizations in the 1960s, including the Tlateloco Massacre in 1968, and the brutal repression of a 2006 teachers strike in Oaxaca. The historical pattern is one of state abuse against mostly harmless citizens who feel denied democratic participation. The Peña Nieto administration’s reactions thus far do not suggest a desire to break with that pattern, even in the face of public outrage over this month’s killings. The Mexico representative of the United Nations High Commissioner for Human Rights and others have called for an independent investigation into the Nochixtlán violence, but the government’s stonewalling of the Ayotzinapa investigation suggests these attempts at overcoming impunity face dim prospects. Education Minister Aurelio Nuño’s statement the day after the confrontation confirming the government’s commitment to uphold the education reforms further fueled public anger. Absent an independent evaluation, the bloody events of June 19 could remain as evidence that the Mexican government is simply unwilling to overcome its historical tendency to attack those it considers subversive. * Marcie Neil received her Masters in Latin American Studies at American University in 2015 and served as a Graduate Assistant at the Center for Latin American and Latino Studies. Elections last Sunday didn’t give former President Michelle Bachelet the strong mandate that she wanted but she appears well positioned to win the second round and the honor of serving a tough second four-year term. An underwhelming number of Chileans headed to the polls to cast their votes for the president of the republic, parliamentarians, and for the regional councilors. Polls had indicated that Bachelet would win convincingly in the first round but, with 46.7 percent of the ballots cast, she fell just short of the 50 percent needed to avoid a run-off election on December 15. Conservative Evelyn Matthei, from the governing right wing Alliance Party, received 25 percent of the vote in the first round and has little chance of winning the run-off: another 17 percent of Chileans voting in the first round opted for candidates running to the left of Bachelet, and observers predict they will either stay home in December or select the former president as a second best option. A 2012 change in voting law appears to have hurt Bachelet’s percentages. Under the new norm, Chileans for the first time were automatically registered to vote in presidential and congressional elections upon reaching 18 years of age, instantly expanding the electorate from eight to 13 million potential voters. But also for the first time, voting was not compulsory, and that proved consequential. In a country where public opinion polls have long shown high levels of alienation from the political system, particularly among younger segments of the population, abstention reached unprecedented heights. Fewer than seven million Chileans turned out to vote on Sunday, representing only around half of those eligible to do so. Turnout was undoubtedly suppressed by the stubborn persistence of Chile’s binomial electoral system, a holdover from the Pinochet dictatorship’s 1980 Constitution that gives the losing party a bloated presence in Congress (in order to receive both seats in any given district, the winning party or coalition must win double the percentage of the vote received by the runner-up, so frequently even a wide margin between the two top vote getters generates an equal allocation of seats). Bachelet’s center-left coalition, the New Majority, has proposed amending the constitution to make the electoral system more reflective of public preferences. But the newly-elected Congress, selected according to the rules of the authoritarian regime, is unlikely to generate the super-majorities needed to achieve constitutional changes that would alter the system so as to democratize congressional representation. Getting elected to a second four-year term as Chile’s president might prove to be the easy part for Bachelet. Harder still will be pushing forward the ambitious policy reforms she has promised. 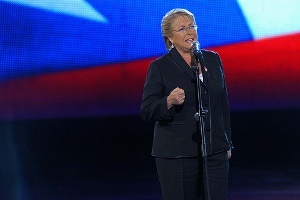 An especially prominent issue in the campaign was the demand of a growing student movement to reform Chile’s privatized education system, and Bachelet responded with a pledge to guarantee free, quality higher education to all Chileans, to be funded by a proposed increase in corporate tax rates and elimination of tax deferrals used widely by Chilean companies. Yet while Bachelet’s bloc secured the simple majority needed to secure modest tax reform, it fell short of the super majorities needed to secure education reform or change the electoral system or constitution, and the rightist opposition is loath to cede ground on either of these issues, which are also legacies of the Pinochet constitution. To enact the key pillars of her agenda, Bachelet’s second presidency will need to calibrate difficult negotiations with Congress with popular pressures to fulfill democratic aspirations for political representation and a more social democratic approach to public services than has been possible to achieve during the first 23 years of post-authoritarian rule. President Peña Nieto’s reformist agenda wins kudos from the business and financial class, but both a recalcitrant leftist opposition and mass organizations previously aligned with his party are taking to the streets in protest – raising serious doubts about its prospects. In his first state of the nation speech, delivered last week, Peña Nieto pledged to plow ahead with “transformational” reforms, giving flesh to the PRI’s slogan that it is Transformando a México. In education, he’s proposed a more rigorous system for hiring, evaluating, promoting and firing teachers who have resisted change despite evidence that the current system is not equipping Mexican youth for employment. In the energy sector, he wants to open up the oil and gas industry to foreign investment, an idea that was strictly off-limits in the past even though lagging investment has caused production in Mexico’s leading export industry to decline steadily. He is also pursuing tax reforms that, although watered down when announced on Sunday, entail political risk and, tellingly, raise marginal rates by 2 percent for higher earners and impose a levy on capital gains. In June, he picked a fight with powerful business leaders over control of the country’s telecommunications industry, an oligopolistic structure that imposes excess costs on consumers and producers alike, diminishing Mexico’s economic competitiveness. The teachers unions, whose symbiosis with the PRI in the past ensured cooperation, mobilized huge protests in Mexico City, forcing Peña Nieto to delay his speech by a day and then causing monstrous traffic jams during it. The President cloaked his announcement of the energy reform in nationalistic rhetoric, and PEMEX, the oil company, followed it up with predictions of positive results – huge increases in oil investment and production that purportedly would help to create 500,000 new oil-sector jobs by 2018 and 2.5 million by 2025. But opposition to the reform has been strident, and tens of thousands filled the Zócalo on Sunday to protest it as a “covert privatization.” Opposition leaders are already pledging demonstrations to oppose taxes, though the likelihood of this may be diminished because the long rumored reform unexpectedly left untouched the value-added tax exemption for food and medicines, which would have been a major rallying point for the Left. Some Mexican commentators say Peña Nieto’s leadership is already losing its shine and that his Pacto por México, the loose coalition he engineered in Congress, is at risk of falling apart. He prevailed in his congressional showdown over the long overdue education reforms, but success in transforming the underperforming education sector appears uncertain, as the teachers are threatening more protests. The arrest of narco bosses from the Gulf Cartel and the Zetas have not given him a bounce on the security front; indeed, Mexican press reports indicate that kidnapping, extortion and other crimes that more directly affect citizens’ lives continue to rise. 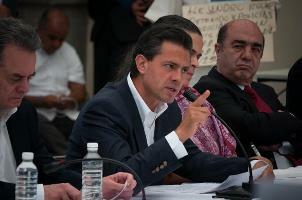 Further complicating Peña Nieto’s life is news last month that the economy is slowing down. The first contraction in four years has forced the government to cut its 2013 GDP growth forecast in half, to 1.8 percent. The administration will undoubtedly point to data showing that PEMEX production has fallen by about a quarter in the past decade because of low investment, and will emphasize that this makes modernization of the oil sector all the more imperative. But Mexicans have heard promises before, during NAFTA debates and since, that economic reforms and greater openness to trade and investment will massively improve their lives. Whether there is any fuel left in that rhetorical tank remains to be seen. Following a year of student demonstrations, Chilean students have renewed their demands for education reform with a massive street protest in Santiago. According to a report from the BBC News, 25,000-50,000 students participated in a march for free education on Wednesday. The protest came despite President Sebastián Piñera’s announcement that a state agency would be created to finance university-level education and that private banks would no longer be permitted to provide loans to university students. Piñera also announced that interest rates on student loans would be reduced from 6 to 2 percent. The student protests are just one of several political issues confronting Piñera, such as the construction of dams in Patagonia and government handling of political protests in the southern region of Aysén. 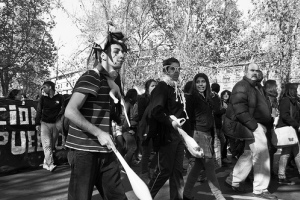 The students’ cause has reverberated throughout Latin America and indicates widespread discontent with high levels of socioeconomic inequality in Chile.